The customers of Bonpreu Esclat can now round up their purchase! Condis collaborates with the Spanish Federation of Rare Disease (FEDER). As you know, at the end of last year, Condis Supermarket launched the Social Round Up in their establishments (remember it here). Since then, their customers have the opportunity to round up their ticket and donate the difference cents to social cause. So far, all the funds raised have been donated to “Fundació Arrels” (in the case of supermarkets located in Catalonia) and EDUCO (establishments in Madrid). Coinciding with the International Rare Disease Day – which will take place next February 28-, Condis starts a new challenge with the objective of proportionate an attention and help service to children with rare disease and their families. In order to achieve it, the total amount collected will go directly to the Spanish Federation of Rare Disease (FEDER). A disease is considered rare when it affects a limited number of the total population, defined in Europe as less than 1 per 2,000 citizens. It is estimated that, between 6 and 8% of the world population, more or less, has an ER. That is, more than 3 million Spaniards, 30 million Europeans, 25 million Americans and 42 million in Latin America. FEDER works for a world in which people with a rare disease have the same opportunities in life as the rest of society, regardless of the rarity of their disease. Their main reason for being are families with a rare disease, they accompany them in their day to day to help them in their needs, in the search for a diagnosis, to find a second medical opinion of experts in their pathology, in psychological support to the family, in legal advice and they put in contact the different people affected, and try to make them aware of their illness. If you’re shopping in a Condis Supermarket and want to round up your ticket, indicate it in the cash service. Cashier staff will round up the final amount of your purchase and continue with the usual payment process. A code will appear on your purchase ticket. You can use it to obtain your donate certification. Are you a retailer and would like to offer the Social Round Up? Contact us contact@worldcoo.com and we will give you all the details. After collaborating with Pupaclown and Fundación Theodora in order to share smiles between hospitalized children (you can remember the project HERE), the customers of PcComponentes start a new project today. Since the beginning of the economic crisis in Spain, the number of children at risk of poverty or social exclusion has been increasing. Today more than 2.6 million children – that represents one in every three- are in this situation. Malnutrition is one of the direct consequences of this situation and it is estimated that more than 260,000 children cannot afford to eat meat, fish or chicken twice a week. Now, when buying at PcComponentes it is possible to add €1 to the shopping basket and collaborate with Educo in order that kids at risk of social exclusion or poverty can receive a daily meal in their school during one year. Thanks to the amount raised through PcComponentes, 1,200 meals can be provided, which means that 8 children will be able to eat daily in their school canteen throughout the course. As usual, we remind you that you can follow the donation process HERE. Since many years ago, the users of Nicequest community have the option to exchange their “conches” (points that they receive in exchange for answering the completion of different types of surveys) by charity donations to different projects, which vary according to each geographical territory. Approximately every month, upon reaching the established collection goal, the company presents its users with new social causes with which to help. Now the company has launched a new project worldwide with the aim of reducing the housing deficit in Peru and guarantee access to decent housing for all families. Did you know that Peru is the 3rd country in Latin America with the largest housing deficit? 4 of every 10 inhabitants of Lima do not have decent housing. Nicequest users will collaborate to stop this situation. To achieve this, we are very happy to share with you that we have just signed a new collaboration agreement with TECHO – Peru, a social organization that works for the community development of the popular settlements of Lima, Callao. Piura and Trujillo. They collaborate for the sustained work of the hand of the communities to give an effective and immediate response to the needs previously identified, and thus transform the lives of Peruvians in poverty. TECHO manages the construction of emergency housing, which is a space that meets the conditions to improve the quality of life of its inhabitants, as well as a rapid response to natural phenomena. Through the amount collected through the Nicequest users, 4 families with housing needs will be able to have a home. We remind you that, if you want, you can follow the fundraising campaign in real time HERE. Bon Preu Esclat is the latest supermarket which has joined our “Companies with a Cause” community; they’re companies that offer their customers the option to round up their purchase and donate a few cents to charity. In line with its social commitment, the Group Bon Preu is committed to promote the small donations to achieve big projects. Since now, their customers have had the opportunity to collaborate with many fundraising campaigns through their “customer card”. Now they will able to do the same in the physical store. When paying with card, the same dataphone will ask if we want to round up our ticket and donate the cents to a social cause. 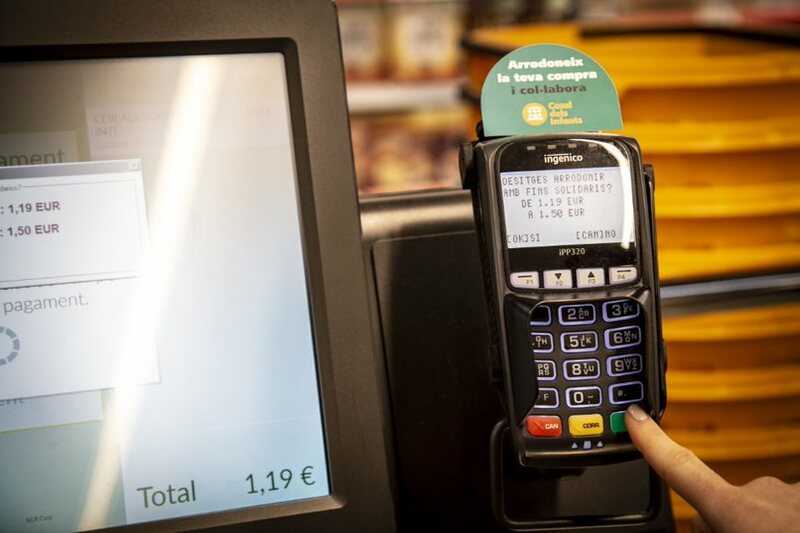 To collaborate, the customer just has to press the green button and continue with the usual payment process. Did you know that in Catalonia the 14% of students don’t have the high school education? Inequality presents a clear territorial dimension and punishes especially some neighborhoods and municipalities in the country, where many families suffer social and economic precariousness. The local entity Casal dels Infants has been working for 35 years with the aim of preventing school failure of more than 2,000 young people at risk of exclusion in Catalonia. Through the amount collected, the entity will be able to offer support and school reinforcement to those young people from the neighborhoods of Catalonia who concentrate inequality situations and thus promote equal opportunities. Clients can follow the status of the project collection or request their donation certificate through the web https://bonpreu.worldcoo.com/es/. Do you have a retail and would like to offer the Social Round Up? You just have to write us through contact@worldcoo.com and we will give you all the details. Unfortunately, 1,400 new cases of childhood cancer are diagnosed each year. 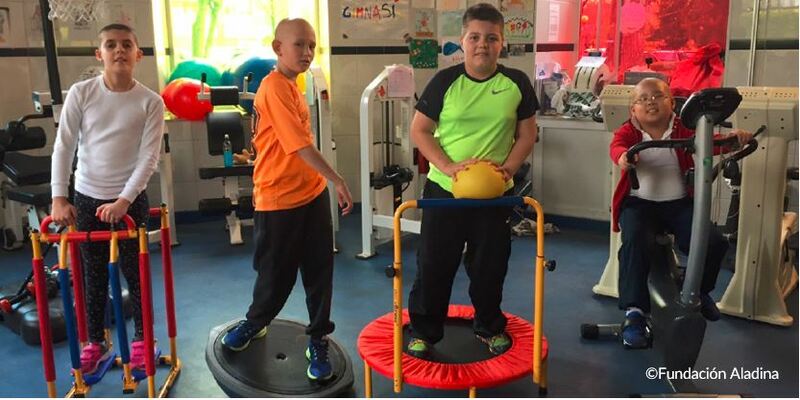 The practice of physical exercise helps children with cancer to be more tolerant to treatments and helps to alleviate the side effects of these. It increases the muscular strength of children, decreases the systematic inflammatory levels and improves the immune function, reducing fatigue. That is why the Aladina Foundation has launched the Aladina Sports Scholarships for children with cancer and families. Through this initiative, the entity can favor specialized physical exercise therapies for children and adolescents with cancer. After collecting the necessary amount so that 20 students can participate in activities where Ayuda en Acción promotes gender equality and opportunities (you can remember the project HERE), now Sprinter customers start a new project to promote the practice of physical exercise between children and adolescents. Thanks to the contribution of Sprinter, 10 children with cancer will be able to participate in these specialized physical therapy therapies for a month. The total amount collected will go entirely to the entity, who can perform specialized physical therapy therapies for a month. Remember that, if you want, you can get more information and know in which state this project is found HERE.